Aim: Great Connell Abbey is a site of ongoing interest and has been extensively investigated and researched by Dr. Thomas A. Loughlin of the Irish Hellenic Institute, Athens, Greece and funded by the Kildare County Council Community Heritage Grant and Kildare Archaeological Society Research Grant. The abbey was founded in 1202 as a Priory of the Cannons Regular of St. Augustine, a cell of the Llanthony Prima in Wales. It was founded by Myler Fitzheny, Viceroy of Ireland, who was also responsible for the foundation of the abbeys at Laois, Clonfert in County Galway and Killaloe in County Clare. The site had a period of active usage of approximately 350 years and had a somewhat turbulent history having been ordered to forbid the admittance of Irishmen by King Richard II in 1380 and being destroyed by the native Irish approximately seventy years later and eventually being suppressed in 1540. 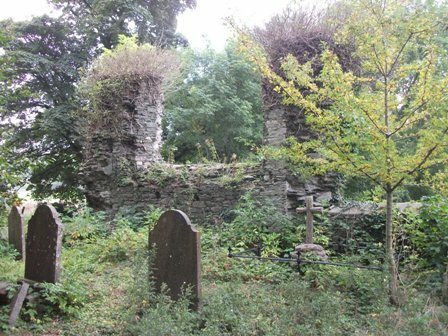 The site gradually fell into disuse, with a Church of Ireland church being constructed to the north of the site in the year 1780. Earthsound originally carried out a Magnetometry survey at the site in 2006 which revealed a large amount of the village and structures associated with the priory. In the two seasons of geophysics which built on this as part of Thomas A. Loughlin’s research project, the aim was to focus on locating unknown archaeological remains through the use of LiDAR as well as to investigate possible structures associated with the priory. The aim was to locate archaeology associated with the priory lands including mill races and structures associated with the priory itself. This centred around the use of LiDAR, Magnetometry, Earth Resistance and Electromagnetic Induction surveys. Outcomes: The 2012 season located a large enclosure with approximate dimensions of 300 m x 360 m which may represent the enclosing boundary of the entire settlement as well as a number of possible walls and boundaries, pits, structural remains and possible burial pits. A large number of internal ditches and features were also located. The 2013 season managed to detect a large number of cut archaeological features as well as to identify a number of possible structural remains which may have been associated with an only recently identified mill course.